The ankle and foot are mostly superficial structures and thus are particularly suitable for ultrasound evaluation. Direct patient contact allows accurate identification of the site of symptoms and allows a pertinent history to be obtained. Ultrasound also offers real-time comparison with the contralateral side. In addition, the dynamic nature of ultrasound may allow visualization of intermittent pathology, such as tendon subluxation and impingement. The internal vascularity of pathology–-e.g., synovitis–-can be assessed with Doppler without resorting to intravenous contrast injection. Magnetic resonance imaging (MRI) also has many inherent advantages including the imaging of deeper soft tissue structures, bones, and joints, and it is less operator dependent. 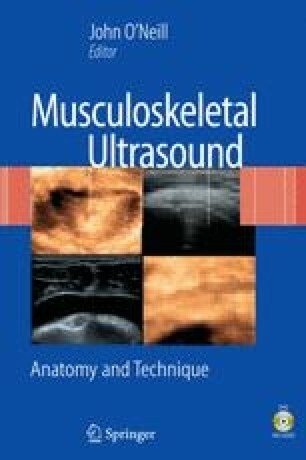 MRI and ultrasonography are, however, complementary imaging techniques and the choice of modality will often depend upon local expertise, accessibility, and cost. Primal Anatomy. Interactive foot and ankle: Sports Injuries Edition 2.0. http://www.anatomy.tv/home.